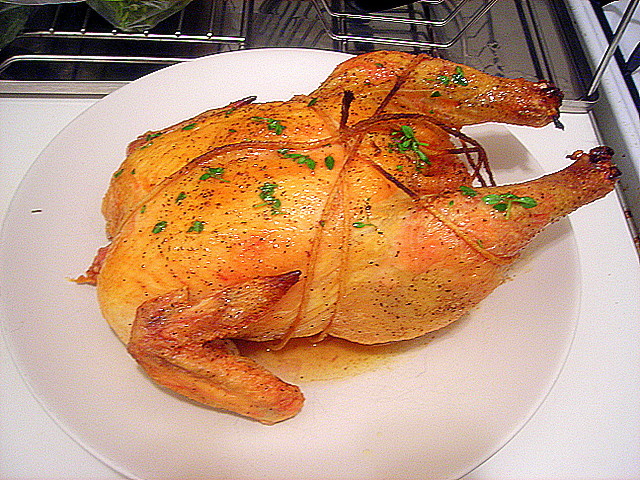 Thomas Keller’s recipe for mon poulet rôti is here. Leftovers will be turned into chicken salad and chicken congee. The carcass will be used for stock. For the potatoes, prep them into 1/4″ slices and fry in melted unsalted butter over medium heat. Sprinkle generously with salt and pepper. Fry until golden brown and transfer to a bowl. Add chopped watercress to the hot pan. Stir until cress wilts, about 15 seconds. Return potatoes to pan, check seasoning, stir in some chopped parsley or thyme and serve immediately. 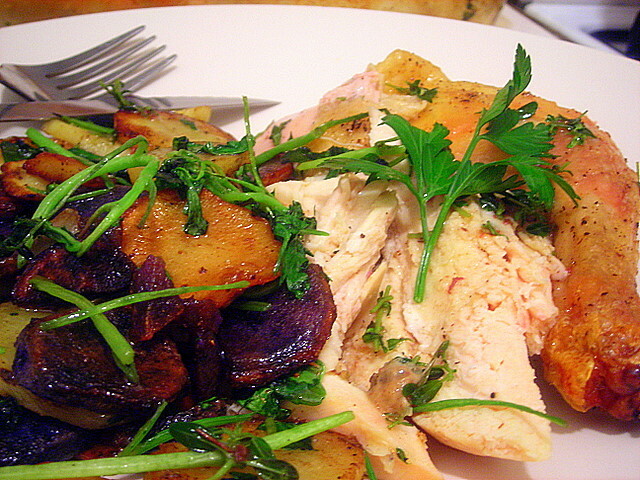 There’s a reason why roast chicken is a classic “basic” dish. It’s culinary simplicity embodied in a neat little package. Made well, it can be sublime. Chef Keller’s recipe is about as minimalist as you can get. Once you cook it this way — and this is my fifth or sixth time doing it — you’ll rarely switch to another method. It’s THAT good. 08 May	This entry was published on May 8, 2009 at 12:40 am. It’s filed under food, general and tagged cooking, dinner, potatoes, roast chicken, watercress. Bookmark the permalink. Follow any comments here with the RSS feed for this post. I love Keller’s roast chicken. Not only is it the tastiest roast chicken I’ve made, but it’s the easiest to make. Those potatoes look great! I used to stuff the cavity with garlic, lemon, herbs, etc. or slip pats of butter or duck fat under the skin. Keller’s method beats them all. I should add that if you’re afraid of butter and salt, last night’s dinner isn’t for you. I have a feeling you’re not but other readers of this blog might be. 😉 The secret to good pan-fried potatoes is to use lots of butter. In this case, it was Lurpak, a Danish butter with a higher butterfat content than regular American butter like Breakstone.